When the world famous Challenge Roth hosted the official ETU European long distance championships for the first time, over 3,000 athletes from 62 nations competed. The race consisted of a 3.8km swim in the Main Donau Canal, a 180km bike ride and the final 42.2km marathon run. Heyden-Securit GmbH, the official Magicard Master Dealer for Germany, Austria and Switzerland was tasked with designing a comprehensive and reliable accreditation system well in advance of the event. 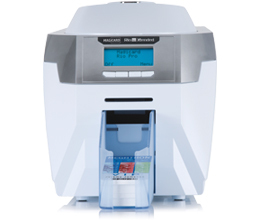 Heyden Securit’s complete ID card solution featured the Magicard Rio Pro Xtended long format printer, Card Exchange software, Xtended PVC cards and personalised lanyards. Challenge Roth were really impressed with how professional the cards looked and how quickly they could be produced. In total, Heyden-Securit delivered more than 1,500 personalised credentials. The Xtended cards were preprinted and punched prior to the event. On the day organisers in Roth simply had to personalise each one with the details of officials, VIP guests and the world’s press. Each card was personalised and printed instantly using the Magicard Rio Pro Xtended printer integrating seamlessly with Card Exchange software. For this prestigious event, Challenge Roth used high quality PVC Xtended cards for the first time, having previously used laminated paper IDs. The organisers were delighted with both the professional appearance of the cards, and the ease in which they could be produced. The Magicard Rio Pro Xtended personalises extra-long plastic cards for ticketing, accreditation and product labeling. Long format cards provide more design options, superior visibility and are widely used for security badges at sports and music events.